Here is a tutorial from Riftcat for using LEAP to simulate a Vive Controller. Obviously, you must have Riftcat. I’ll have to unpack my LEAP and see how this works. As it is hooking into the Steam software, this may well work with Sansar. But, that is another experiment. Posted in Gear VR, General Computer Stuff, SANSAR. This morning I see the Vive has dropped in price. The retail price of a new Vive is now a mere US$600. That is better than the previous $800. But still expensive. 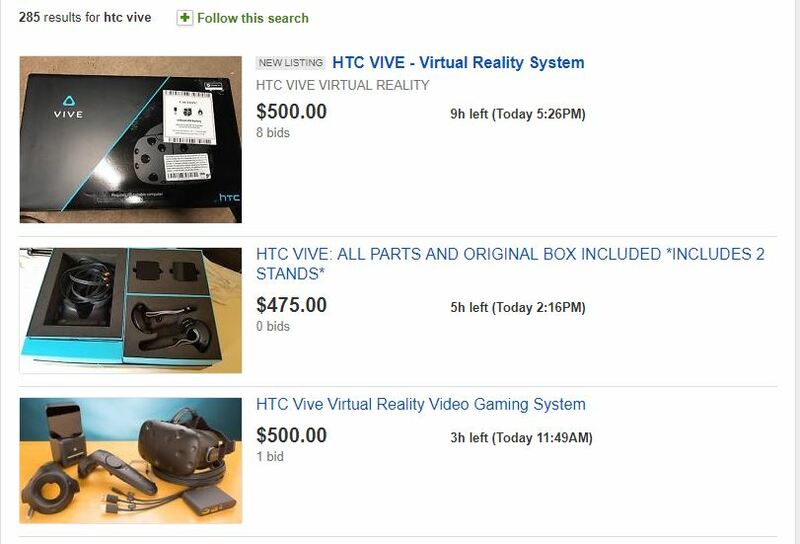 Vive headsets have been going on eBay for about $500 for some time. Gear VR units are going for $65 on eBay. Sansar is supporting Oculus and Vive. I have neither. So, how well they are supported and how easy they are to setup with Sansar, I don’t know. I have yet to get my Gear VR working with Sansar. So, I know that is difficult. I think I am down to a ‘controller’ problem. I have an Xbox 1708 controller on order (US$20-30±). If you Google on Vive and SL, you may get the idea Vive and SL will work for VR. That isn’t the case. The information is almost all 2016 stuff written before the Lab dropped their SL VR project and CtrlAltStudio stopped VR Viewer development. I have been able to get SL into 3D, not VR, with my Gear VR. Not really worth the effort. It’s a nice novelty. I have used the old CtrlAltStudio Viewer to see SL in VR. There is no Bento support. Until someone decides to merge the CtrlAltStudio code and an updated Firestorm there is essentially no ‘native’ VR support for SL. There is some third-party software for various games to get them into VR. Most of those are for DirectX games, not OpenGL. Posted in Gear VR, General Computer Stuff, Hardware. Tagged Gear VR, HTC Vive, VR. Oculus is pushing updates. A beta update is available allowing a user to combine their Oculus and Steam games in one library. That will be handy. As it is now I have problems getting Stream VR working on my Gear VR. It does not like the Gear VR’s controller. So, I’ll have to get the Beta and see if it relieves the problem. My hope is because Gear VR and the Oculus store are integrated that will carry over to Steam games in the library. Get More information from Road to VR, Oculus 1.17 Update Will Let You Launch SteamVR Apps From Oculus Home. This is for NVIDIA owners… sorry AMD peeps. It’s a software limitation. So, you want to see Second Life™ or any OpenGL game on your Gear VR. Well… you are going to have to learn a lot. You’ll also find few are telling you what the result of their tutorials or apps actually provides. Advertising hype is everywhere. If O N E PC or OpenGL game will run or even sort of run, then PC and OpenGL compatibility is the headline. Expect disappointment. I’ll explain what worked for me below. Visual quality is the next point of disappointment. My S8 has a 4k screen. I normally run it at 2k to save battery. In everyday use, 2k is pretty much retina resolution, way sharp and crisp, beautiful. 4k is overkill. If I didn’t tell you which mode the phone was in, you probably couldn’t guess. The Gear VR turns the phone up to 4k when connected. Most VR headsets are NOT 4k and thus most media is made for 2k and that media is fuzzy on my 4k screen. Looking at my 1k 24” Samsung monitor is way nicer. Posted in Gear VR, General Computer Stuff, General News, Hardware, Second Life, VR Stuff. Tagged Gear VR.